The separatist group the Hong Kong National Party is getting way more publicity than it deserves, thanks to heavy handedness from the pro-Beijing side. 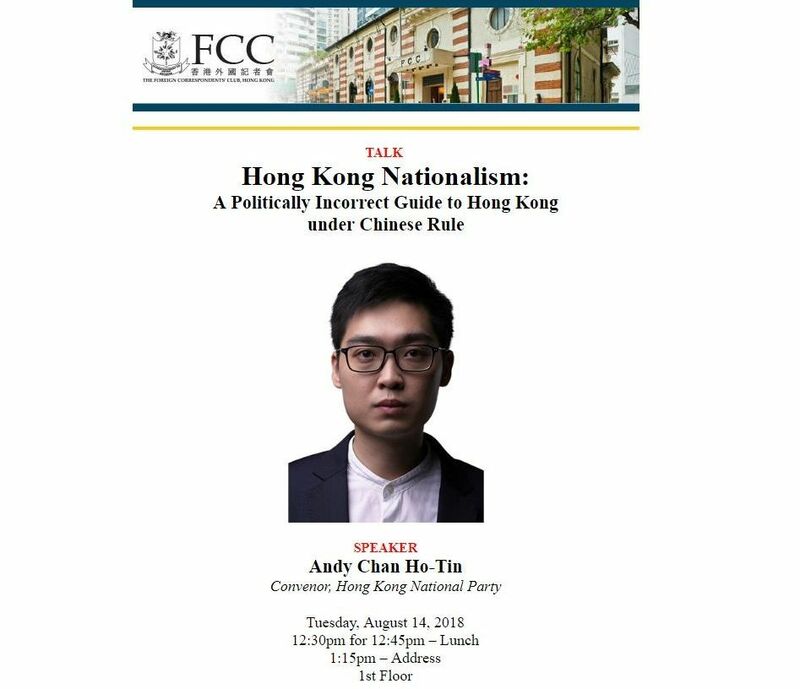 This time it's former chief executive Leung Chun-ying attacking the Foreign Correspondents' Club for inviting HKNP's co-founder Andy Chan Ho-tin to speak on August 14. 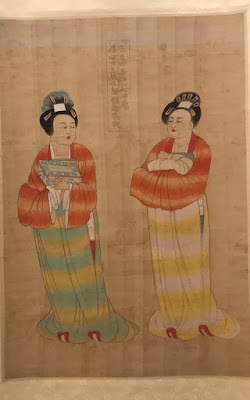 At first China's Ministry of Foreign Affairs asked that the talk be cancelled and the FCC politely said no. This is not unusual -- there have been several instances before when Beijing has asked for other talks to be cancelled because they don't like the speaker, such as former governor Chris Patten. And the FCC has said nicely that it will still go ahead with the talk and then the matter is over. However, this time Leung has ratcheted it up several notches by demanding the FCC should give up its lease on Ice House Street in a heritage building and bid for the premises in an open market. 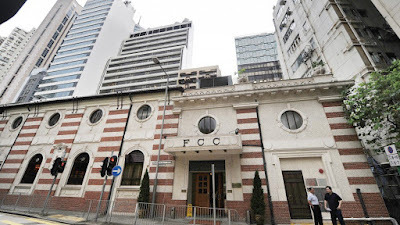 Chris Yeung Kin-hing, the chairman of the Hong Kong Journalists Association said: "Leung is essentially asking the FCC to cancel the talk by Chan and stop inviting similar guests in future, or else the lease might not be renewed or even be taken back earlier. That's blatant political pressure." The International Federation of Journalists (IFJ) echoed Yeung's statement, describing Leung's remarks as an attempt to "muzzle and publicly threaten an organization that strongly defends the media's role to hear from all areas of society and politics". "The IFJ strongly urges Leung to retract the open letter and the threats made on the FCC over the right to occupy its current premises," said Jane Worthington, acting director of the IFJ in Asia Pacific. Yeung also pointed out the FCC's lease was renewed under Leung's term as chief executive, which was last July. 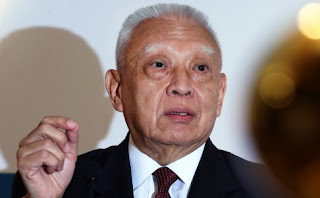 Another former chief executive, Tung Chee-hwa, also waded into the fray, saying the proposal to ban the HKNP was "reasonable and rational", as an advocacy of independence is not allowed. Current Chief Executive Carrie Lam Cheng Yuet-ngor has said inviting Chan to speak was "regrettable and inappropriate". Sounds more like a school master reprimanding its wayward students with a light rap on the knuckles. 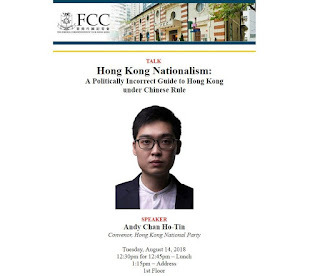 Chan's talk is entitled "Hong Kong Nationalism: A Politically Incorrect Guide to Hong Kong Under Chinese Rule". The FCC is still going ahead with the talk as scheduled as it should -- we're supposed to have freedom of speech here. Instead Leung and the pro-Beijing faction are going at it completely the wrong way. He is giving Chan way more exposure in the media than he really should, and trying to lump in the FCC with him for giving the young man a platform to speak. What a bizarre (but very mainland Chinese) way to get your point across. With that in mind, who's side are you on?